You take professional pride in your appearance on the job, but comfort and style matter too. Our Meta lab coats offer the polish you want, the ease of movement you need and sharp designs that always keep you looking your best. These easy-care lab coats feature all the extras that make a busy working day easier including large pockets, scissor holders and handy access slits. Sturdy construction ensures durable job performance through the longest shifts, and a soft fabric blend of 65 percent polyester and 35 percent cotton resists soil and stains. From petite to extra-large, we've got you covered with our convenient sizing charts for women and men. 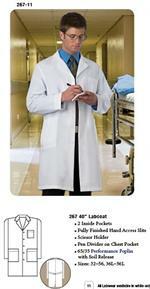 Personalize that professional look with attractive colored lab coats in shades of navy, nickel or light blue. Customize your working wear through our embroidery portal where you'll find more than 20 stylish fonts and a dozen color choices. Count on Scrubs Unlimited for the high quality you demand and the low prices you want. It's always our pleasure to make your working life a little more comfortable. Black lab coats are available, as well.